A few weeks ago, I went to Iceland. I was flying from Belfast so I drove up north and stayed at Steve's house to kill a few birds with one stone. First, he lives about 45 minutes from the airport. I also had beer to deliver and collect. As we tend to do in such situations, we tasted some beer that night. 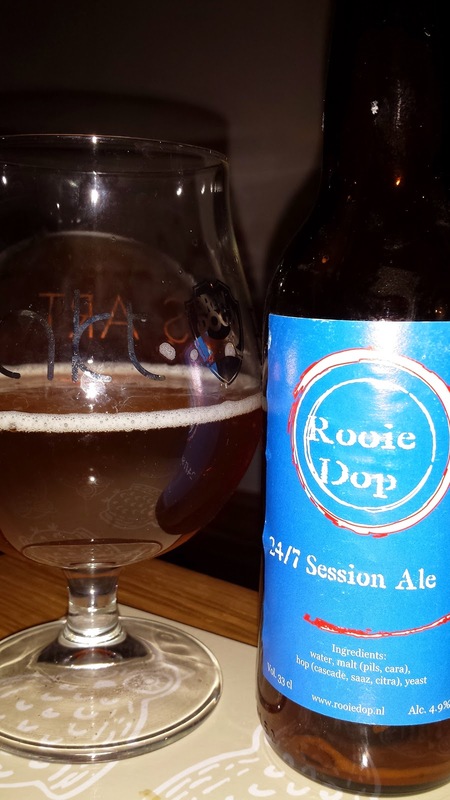 Rooie Dop 24/7 Session Ale is a session IPA though at 4.9%, it's a little on the high side. I provided this one from the beer52 box sent due to their sponsorship of the Beer Bloggers Conference in Dublin. A floral, perfume like aroma along with lemon sherbet. It tastes pretty much as it smells with the addition of a little sour note. It's a little saison like. Not sure what's going on or what they are aiming for here but it works. Rule of Thirds is a collaboration between Siren, Magic Rock & Beavertown. It's a 6.4% blend of each breweries' flagship IPA. There's too much going on in the aroma. It seems every citrus fruit imaginable along with some dank weed from an Amsterdam coffeeshop. On tasting, there's an explosion of citrus and a little malt sweetness with a deep and lingering bitterness. If there's one problem with this beer it's that there's just so much going on. Best just put the notepad or phone down and enjoy the experience. 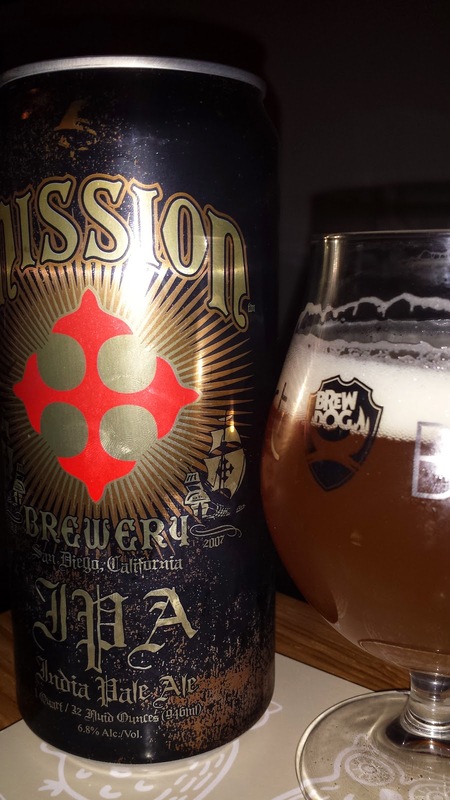 Mission IPA is a 6.8% IPA that came in a massive can just under a litre can, also referred to as a crowler. It was a little spicy on the nose and put me in mind of rye, even though there's none in it that I know of. What was obvious was a little citrus from the classic C hops, cascade and centennial. It tasted a little soapy though, not usually something I enjoy. A little caramel body and slight spiciness. We actually didn't finish the can. It wasn't bad as such, we just had a lot more beer to get through and we weren't enjoying it enough to finish. 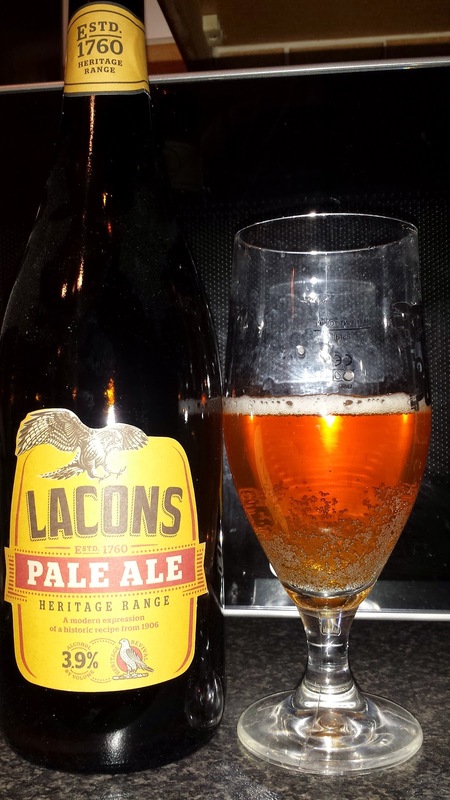 Steve was sent three beers from the Lacons brewery in Norfolk. 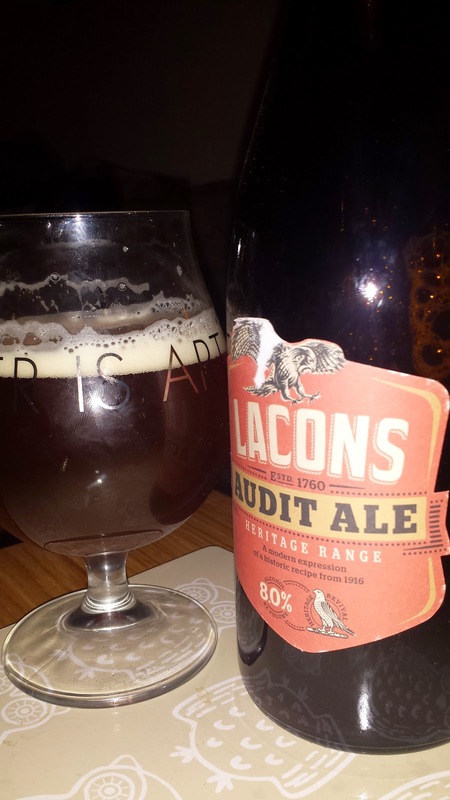 the first one was Audit Ale, the type of beer that sets an accountants heart racing. It's 8%, another figure to soothe everyone's inner accountant. Unfortunately, the beer is a mess. Probably a bad bottle. I found it very metallic. There was a little caramel but still totally undrinkable. Lots of solvent and plastic. This one went unfinished and a new glass was called for. I suspect this was a fluke and another bottle would be much more pleasing to drink. The Extra Stout was a very different story. 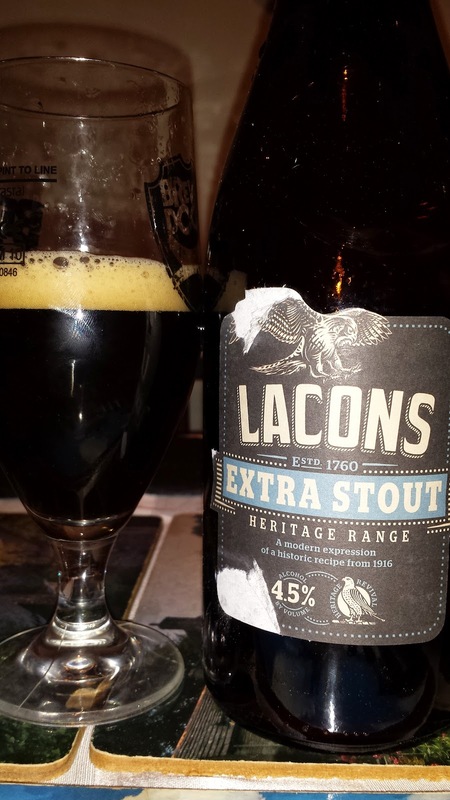 You don't get many 4.5% stouts in a 750ml bottle, those tend to be imperial versions. On the nose was a hint of liquorice and vanilla. Both were present on tasting along with a little dark fruit and a long lingering bitterness. There were hint of citrus too which meant it wasn't too far off a low ABV black IPA. Very low carbonation, almost cask feel to it. Neither of us wanted this beer to end but it eventually did and we had to move on. 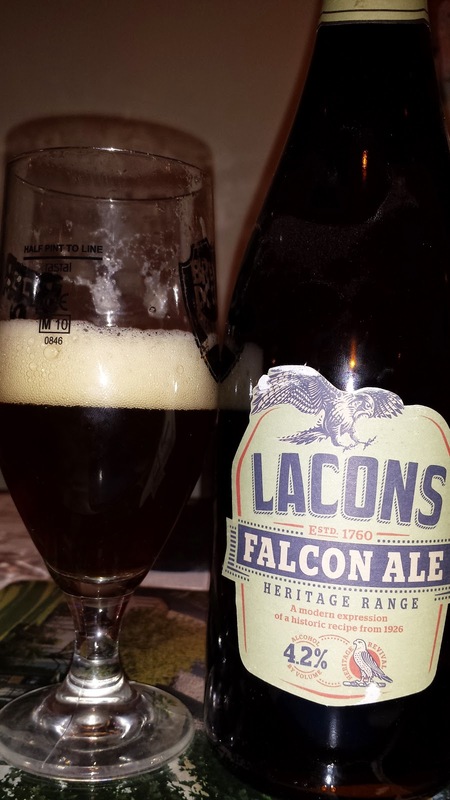 Falconers Ale is 4.2% ABV On the nose was a slight metallic twang alongside some toffee. Very little hop aroma was evident. Might be an old bottle that lost its hop aroma? It tasted pretty much the same. No hop flavours, a little toffee malt but there was a lingering bitterness so clearly there used to be a fair bit of hops in there. I thought it was okay but the metallic notes spoiled it somewhat. I suspect a fresher bottle might be a lot better and I think cask might change it immensely. The Pale Ale was your typical 3.9% strength number except it didn't really taste like your traditional English pale ale. It was packed full of citrus, mostly lemon and toffee malt. I found it delightfully spicy along with a nice biscuity character. It was a brilliant session beer that seemed to marry English malt with new world hops. 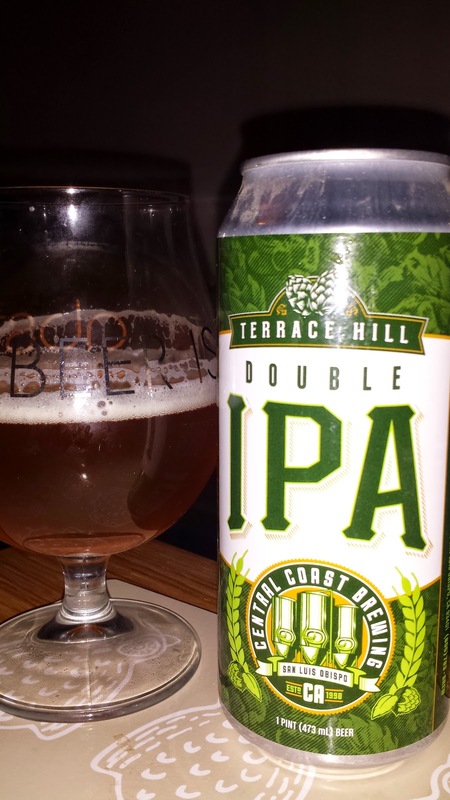 And one more can in the form of Terrace Hill DIPA from Central Coast. This was a 9.5% beer that tasted closer to 6%. Notes of caramel, citrus fruits and some Mystery Machine's finest potpourri. It tastes a lot like Big Daddy IPA, which happens to be 6%. Where's that 9.5% hiding? The body was biscuits and caramel. It's a very nice beer indeed and I wouldn't mind having some more of this.